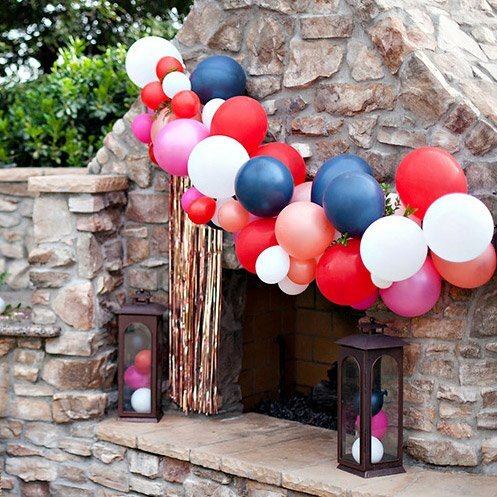 Home/Posts/Parties for Girls, Styled by Jenn/Disney Princess Birthday Party: The Sparkle Station! 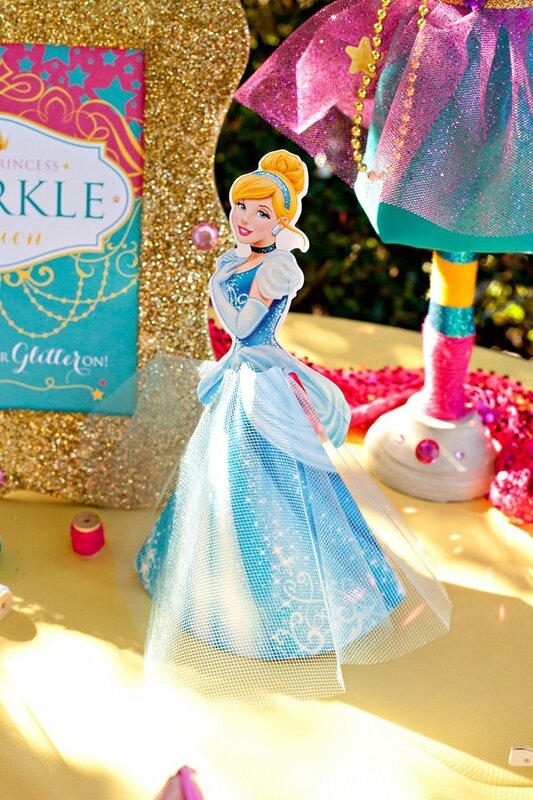 Disney Princess Birthday Party: The Sparkle Station! 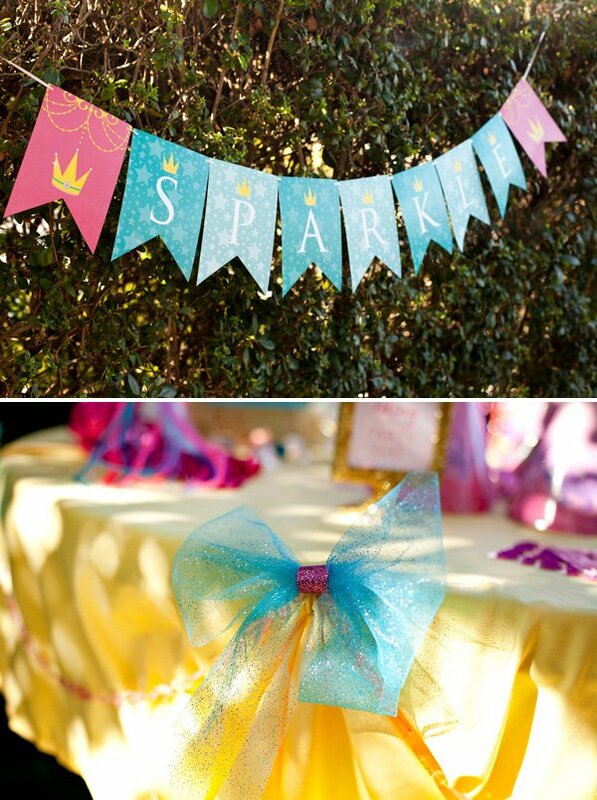 If there are 2 things every princess party needs, it’s SPARKLE and Dress-Up! 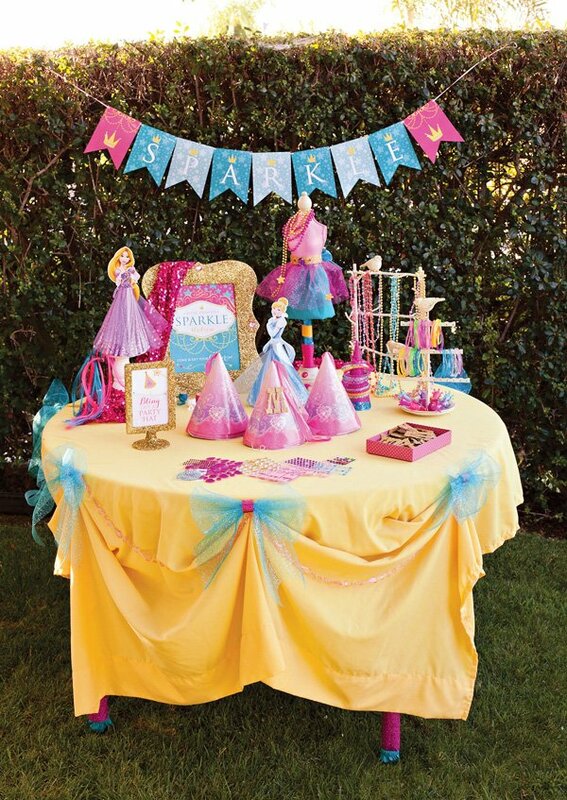 So with that in mind, we designed a Sparkle Station Activity Table for our Disney Princess Birthday Party theme. 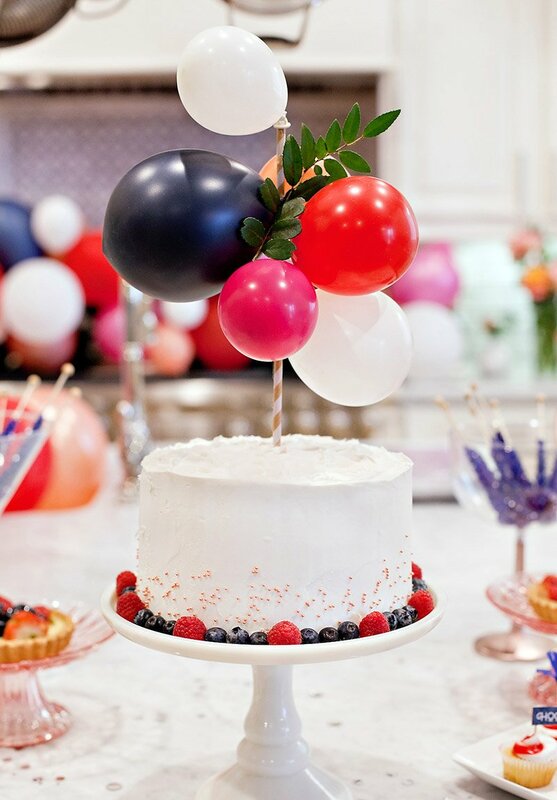 The table was filled with lots of inexpensive dress up items for the royal guests to have fun with, plus a “Bling out a Party Hat” craft complete with glittered initials for personalizing their creations! 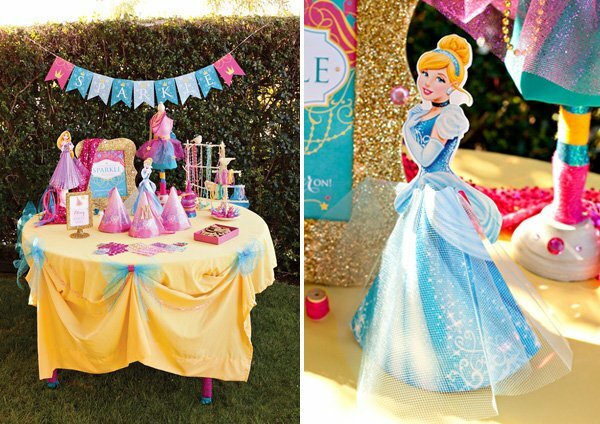 Even though the overall princess party (styled for Dream Parties by Hallmark & Disney) encompasses several of the Disney princesses, Cinderella in particular was a big inspiration for this table. 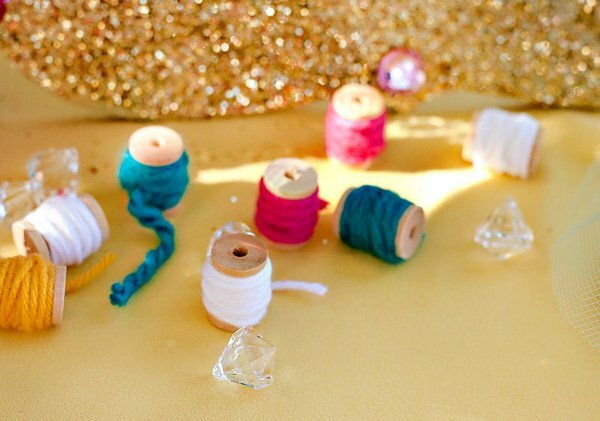 Macy (my 3 year old daughter) has been watching Cinderella a lot lately, and I realized that sewing and dress up really are a huge part of the story – even before the Fairy Godmother arrives! So the presence of the little sewing spools, bows, and dress form were actually inspired by Cinderella’s first dress and the adorable movie scenes with the mice and birds trying to help get her ready for the ball. 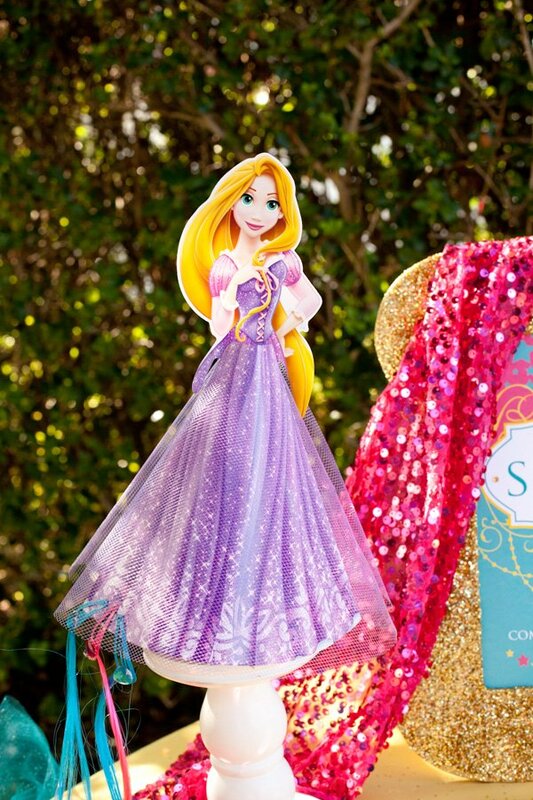 Paper Rapunzel tabletop decoration with dress-up hair extensions clipped to her skirt! When I stumbled on this decorative dress form at HomeGoods (which started out with a simple gray/white fabric body on a plain cream stand, btw! ), it reminded me of when Cinderella’s first dress was hanging in her room, ready for improvements before the ball. 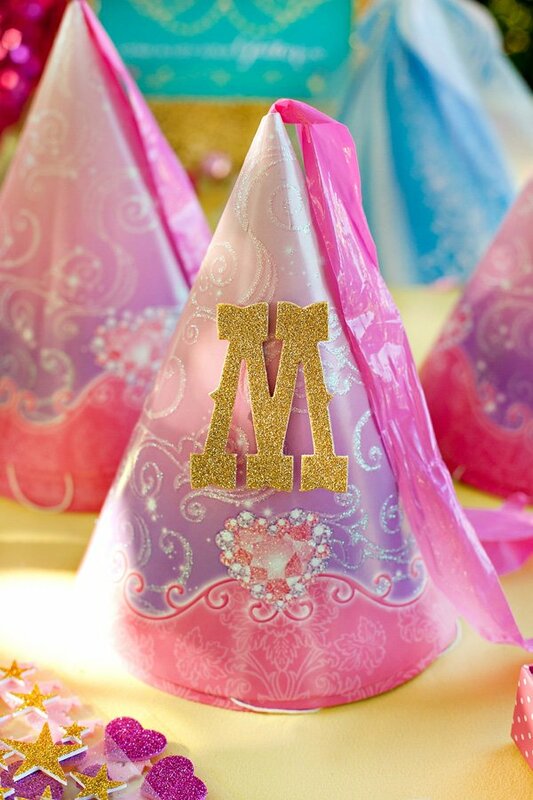 I knew we could transform it into something special for the princess party, but it turned out even cute than I’d hoped! 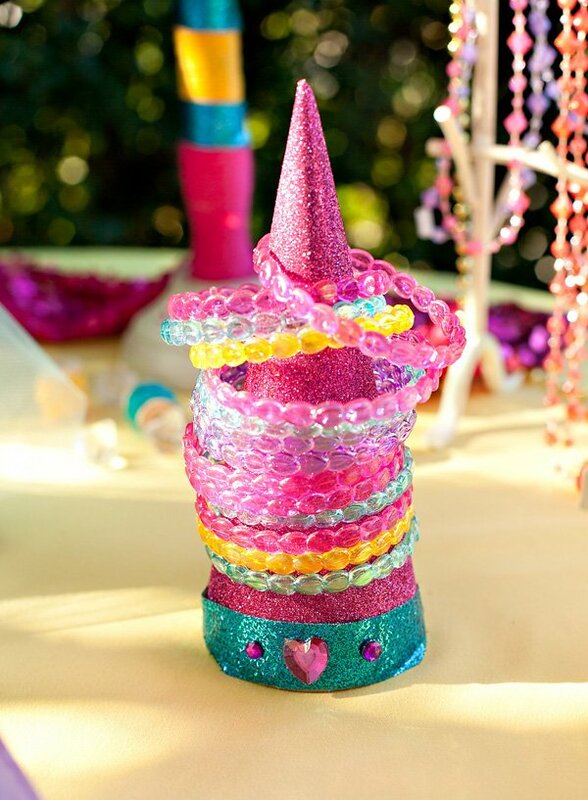 Scattered table decorations: Inspired by the sewing scenes in Cinderella, mini wooden craft spools were wrapped with colorful yarn. And acrylic “diamond” gems added lots of extra sparkle! 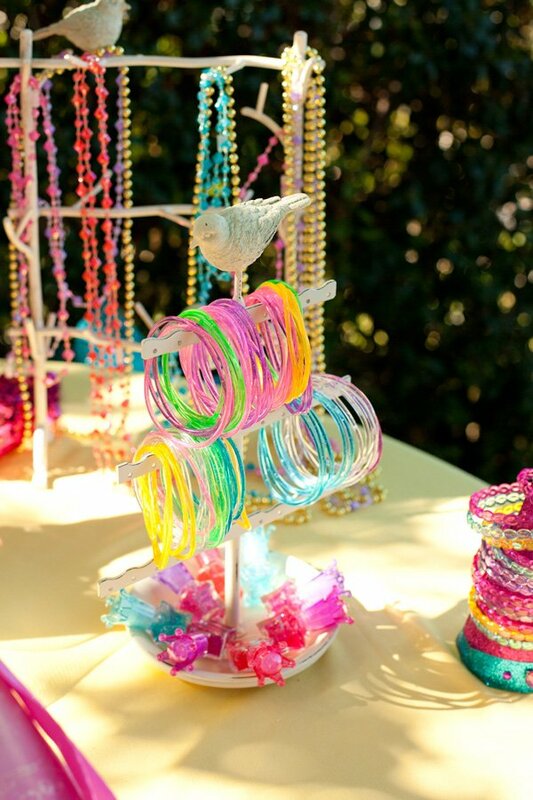 Bird & Branch Jewelry Stands with beaded necklaces and sparkly bracelets for playing dress up! 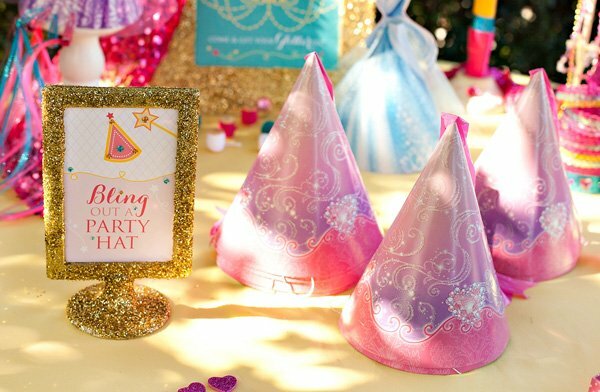 “Bling Out a Party Hat” Station: We set out fun embellishments – like rhinestones, sparkly stickers, and glittered letters – that guests could use to decorate and personalize their Disney Princess Party Hats. Pink painted dress form: This HomeGoods find (which started out as a plain gray dress form!) 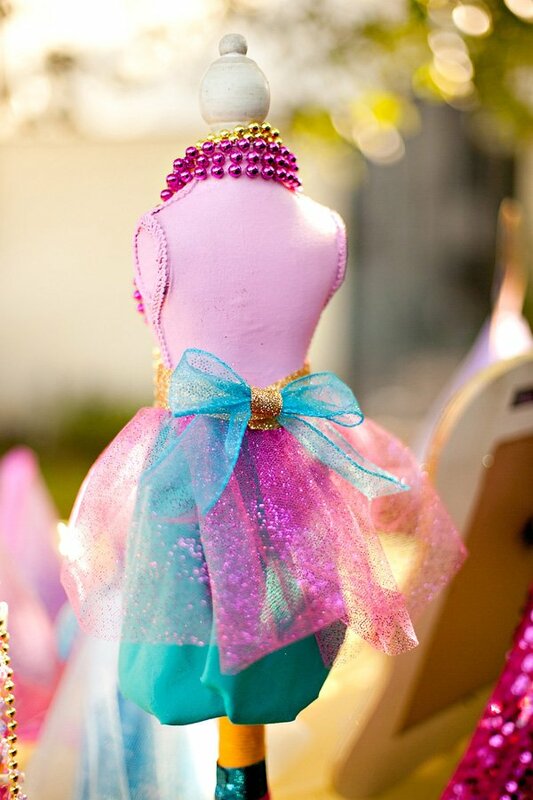 was painted with pink fabric paint then dressed up with yarn, a Sparkly princess skirt (fashioned from tulle and extra fabric), and costume jewelry necklaces. Yellow swag “tablecloth”: This is actually a twin bed sheet (from Target). 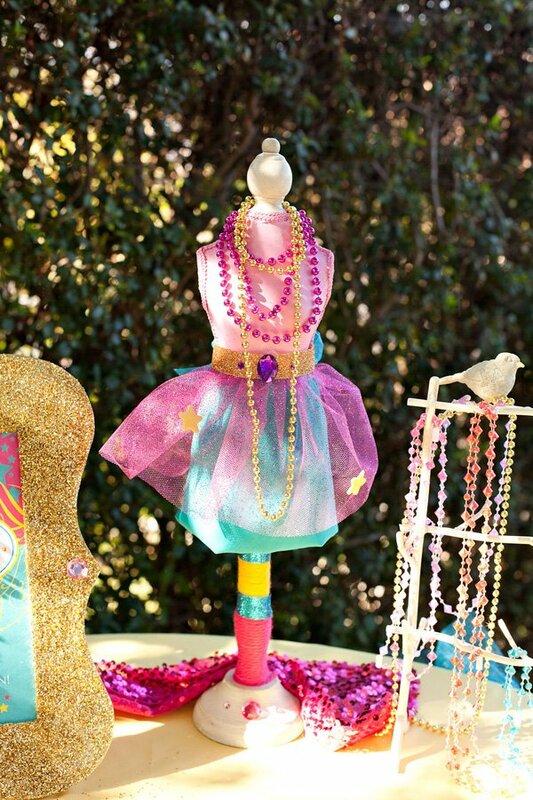 We created a swagged look by simply pinning portions of the cloth up with safety pins, then embellished the look with pink acrylic bead strands & sparkly tulle bows. The acrylic bead strands are leftover from a project a while back – they started off as part of a beaded curtain. Gorgeous Jenn!! Any princess loving gal’s dream! 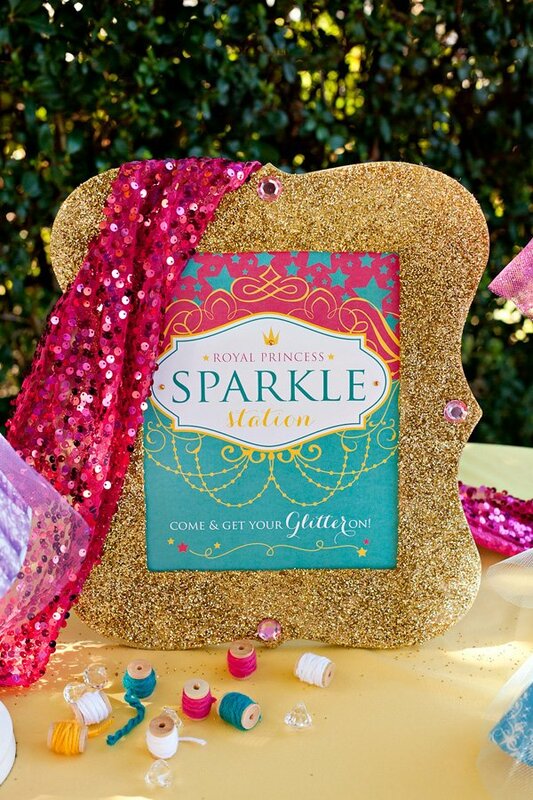 Love all the glittery and especially the Sparkle Station! !